This time I am not apologizing for staying away for so long coz frankly I have done the disappearing act so many times that I am sure people wouldn’t take me seriously anymore. Well there are so many things to say and I have not just been busy but a lot more confused and thoughts so scattered that I couldn’t come up with any sensible post. Let me wish you guys a very Happy Indian Independence Day before starting off. The day not only makes me think about the Indian history and its struggle for freedom but also about how lucky I am to be born in a free country. Not just that it is self ruled but also because in this country I have the freedom to voice my opinion. I am proud of its diverse culture, rich history, strong values and its growing economy. And of course I am proud of the fact that India is emerging as the knowledge hub of the world. “America got to be the second buyer of India’s brainpower! If you were a smart, educated Indian, the only way you could fulfill your potential was by leaving the country and, ideally, going to America, where some twenty-five thousand graduates of India’s top engineering schools have settled since 1953, greatly enriching America’s knowledge pool thanks to their education, which was subsidized by Indian taxpayers”. [wrt the IITs] . We have been watering plants in somebody else’s garden and making them beautiful when plants in our own garden wilted and died. How sad!!! Getting freedom and no more being a colonised country was a giant leap in our history but later we only seemed to have proceeded by taking some baby steps, basking in the past glory and believing that we are a great country just because of our rich cultural heritage. The then current India being dominated by politics and corruption, which still is the case to a great extent. We have had some highs in between all this chaos like the Green revolution, the 1983 world cup and few others. Corruption is a way of life here and politics couldn’t get murkier. I wonder how have we managed to still survive as a country. But thanks to the technology today the world has now recognised that we are not just a country of snake charmers( though a lot of people would like to believe so). The potential of our country is widely recognised. For a change our size and diversity are working to our advantage. The IT not just brought us closer to the world but boosted our economy multifold. But it worth remembering that we still are to a large extent, the backoffice of the world. It is time we moved up the value chain. It is time we leverage the human talent pool that we have. Given the population we can develop many more Tendulkars, Ambanis, Aishwaryas, Kalams….. All we need to is create more opportunities and collaborate towards a better India. 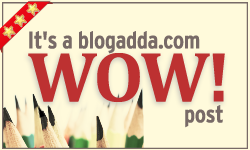 The contest on BlogAdda in collaboration with Pringoo.com has asked us to suggest corrective actions to make our country a better place to live in. Well my first one is to actually live in India and create opportunities here rather than go searching for them elsewhere. With the new acts like RTI we can make our public service and government more accountable. Use it. We already have a lot of rules and checks in place for a harmonious and a fair society. Implement these and implement them in the spirit. Vote and vote for the right people!!! It’s important that we choose the right people to represent us and run the country. Be considerate towards the environment. It is no more a luxury, it is the need of the hour. Say no to corrupt practices (This one is an human element so can’t really be eliminated but that need not become a way of life). There are some things which look too simple to make a difference but it is small things put together that bring about the bigger change. Finally you have written a post after so many days. Well said and a happy Independence Day to you too. Thanks Saumya glad you liked it. since you stay out of India, I was expecting some counter arguments here. Well….what can I say? Once an Indian always an Indian. See, I may stay abroad, but I am amidst so many Indians here, that I am practically spoilt. I feel like our children here are exposed to many more things Indian than the children who grow up in India – there, the children crave for the West, and here, we try our best to expose them to the East. So, I have actually made peace with the fact wherever I live, if I live true to my morals and ideals, I will be fine. To that end, I find living abroad is easier. Every moment is not a moral dispute – why should I bribe the RTO for my license, why should I fight with my bank to retain my money and use it wisely? Like you pointed out, there are positives and negatives in every place.